• For quantitative determination of the apoptosis target caspase-3 activity and HTS screen for apoptosis inducers and inhibitors. • Caspases are members of the aspartate-specific cysteinyl protease family that play a central role in apoptosis. Apoptosis is involved in a variety of physiological and pathological events, ranging from normal fetal development to diseases such as cancer, organ failure, and neurodegenerative diseases. Caspase-3 is key biomarker in the assessment of apoptosis and in understanding mechanism of apoptosis induction. 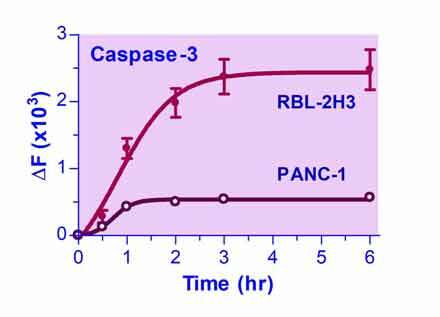 BioAssay Systems Caspase-3 Assay Kit provides a convenient means to measure caspase-3 activity in biological samples. In the assay, a specific substrate (N-Ac-DEVD-AFC) is cleaved by active caspase-3, forming a highly fluorescent product.The fluorescence intensity (λex/em = 400/490nm) is proportional to the caspase-3 activity. No citations for this new product. Please check back later. You may click here to check if citations are available, but are not listed here yet.